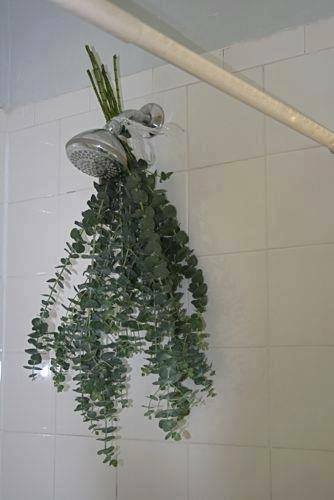 It is common in Italy to find fresh sprigs of Eucalyptus casually tied on to shower heads. When you take a hot bath or shower, the steam will release the eucalyptus oils. Eucalyptus is a natural decongestant, taking a shower with one can help to clear up sinuses and loosen cough. Benefits of eucalyptus oil are well-known and wide ranging, and its properties include anti-inflammatory, antispasmodic, decongestant, deodorant, antiseptic, antibacterial, stimulating, and other medicinal qualities. Eucalyptus essential oil is colorless and has a distinctive taste and odor. In addition to being used for its aroma, eucalyptus oil also has flavoring, pharmaceutical, and antiseptic uses. Eucalyptus oil may also have antibacterial, anti-inflammatory and analgesic properties - people use eucalyptus oil to help treat a wide range of medical conditions. Eucalyptus oil was used in traditional Aboriginal medicines for treating fungal infections and skin wounds. Eucalyptus tea was also administered to reduce fevers. Eucalyptus is used for a range of medical conditions in traditional Chinese and Indian medicine. Eucalyptus oil was used in most hospitals in England to clean urinary catheters. It is also an effective insect repellent.